Race Weld, Inc. is a privately held company now serving the welding needs of event tracks and the race teams of the Hooters' Pro Cup Tour sponsored by USAR, the premiere late model car sanctioning body. Robert (Bobby) Vickers, owner and founder of Race Weld has been involved in all areas of local car racing since 1980 creating contacts with tracks, drivers, racing teams and sanctioning bodies in the South and Mid-West. In this capacity, he has promoted Lincoln Electric welding equipment and welding gas by Linde. This activity was done on the basis of a deep and long time love for racing in general and stock car racing on short track in particular. Race Weld has a rig including a mobile welding shop and by happenstance, the Race Weld traveling welding operation attended a Hooters' Pro Cup race in Ohio. Because of his exhibited professional welding skills and outspoken love for stock car racing, Race Weld was invited to attend future USAR events in both and South and North series. Now, Race Weld is the trackside welder for USAR. 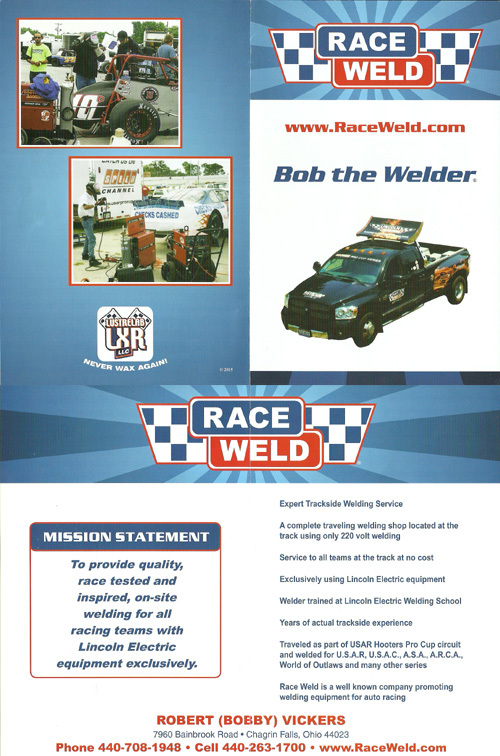 By traveling weekly with his bill board rig to the different races, from Florida to northern Ohio, Race Weld assists the teams in assuring race participation is not prevented due to minor track side welding needs. In this manner, teams do not lose money and championship points after a week of preparation and hundreds of miles of travel. Race Weld has proven the concept of the benefit of a trackside welder for events visiting diverse venues. Now "Bobby" Vickers is the official trackside welder for the USAR Hooters' Pro Cup series and is also a USAR race official. The vision of USAR in pioneering the trackside welder availability to all teams at no cost has made Race Weld visible to both the racing community and the local trackside and TV fans. Consequently, for the 2005 series, Race Weld has purchased a red 38 foot fifth wheel rig, which will travel on the interstates of the eastern United States for over 50,000 miles during the weeks of February through November. This large red rig will be plainly visible to the local fans during the pit and track open times forming a part of every Hooters' Pro Cup event. (1) What is Short Track Racing? NASCAR racing events are generally on an oblong track of at least two miles. The stock cars have long straight aways and large radius curves to reduce the outward gravity force and the available lanes. Short track racing by the Hooters' Pro Cup involves essentially the same cars in the same number, but on a track of about one half mile. Thus, racing is exciting, fans are close and there is a full vision of the race. This is short track racing as promoted by USAR and loved by racing enthusiasts, such as the founder of Race Weld. (2) What cars are in the Pro Cup? Like NASCAR, the entrants of the Hooters' Pro Cup are fabricated vehicles resembling known brands. A Pro Cup car is a fabricated steel bodied, full fendered stock car weighing 3300 pounds with a 600 horsepower engine and radial tires. The engine is not "crated" and can vary slightly. (3) Short Track Fan Loyalty? In short track racing, as promoted by USAR, fans are on the track and in the pits before the race. They are close to the race and are extremely brand loyal. They are purchasers of the whole gambit of products. 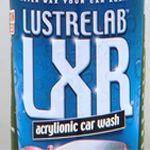 The concept of brand loyalty is well known. (4) Is Hooters' Pro Cup The Best? In only a few years, the Pro Cup has expanded from a South series to a combined South and North series with TV events on each weekend. Plans are now under way to expand into a Western series with a championship for the cars with the most racing points from all three series. With the backing of USAR by the Hooters Group and the decrease or demise of other short track sponsors using cars and formats different from USAR. USAR is the premier short track racing sponsor who is now experiencing increased interest by several corporations with diverse product lines. See the enclosed article from Late Model Racer of sample publisher opinions on the Pro Cup. (5) Is Race Weld a Marketing unit? Race Weld is known to the many teams at the Pro Cup. These teams have a large area of influence in the racing community, including NASCAR teams in the Pro Cup and fabricating shops from Ohio to Florida, especially in North and South Carolina.. Fans at the tracks throughout the Midwest and watching televised events are exposed to the Race Weld rig. Furthermore, the traveling welding shop and the towing truck are visible to many people at many highly populated cities.